This entry was posted in language, Race science, shenanigans of the Left and of non-white activists. Bookmark the permalink. Very good post and I’m going to reblog it :) The only thing I have to say is that race is NOT “imaginary” as the professor claims. Sorry but that is just more political BS. In fact, there are some differences between the races. For example, doctors have recently discovered that treating illness and other conditions as they do for Caucasians do not necessarily work for non-Caucasians so there is a move to tailor certain medical procedures and treatments for a persons race. I’m sure the professor is simply trying to score points by mouthing the political line as any good doobie would and, besides, if he didn’t then he’d never get funding another day in his life from any university. YES early Europeans had darker skin than do modern Europeans and that’s a fact. Although they were NOT black like you see in Africa. They were more of a tanned skin more akin to what we see in Native Americans today. Sadly, reason has nothing to do with anthropology any longer as it’s all been taken over by political correctness and as far as most research goes today we try to ram a square peg in a round whole, meaning, we try to force the facts to fit the most PC theory. NOT science but FAKE science! Real science follows the evidence wherever it leads and if the facts don’t fit the theory then the theory MUST be changed. Sadly, the professor is typical of what we find in academia today. I tend NOT to take the pinhole approach to anything and that includes linquistics. We must broaden our focus and stop seeing everything has having to have started with one! In terms of liquistics I think there were MANY original languages or “mother tongues” not just one just as I believe in the multi-regional theory more than I believe in the Out of Africa theory. Frankly, there are a lot of holes in our modern concept of human evolution and human migration so we need to be careful making claims set in stone. They’re not! Everything in anthropology is fluid and subject to change as we find new evidence or discover evidence for the first time. I also want to mention that black skin is NOT only found in Africa. We also find it in India and Australia et al and these people have NO connection to the people of Africa genetically. 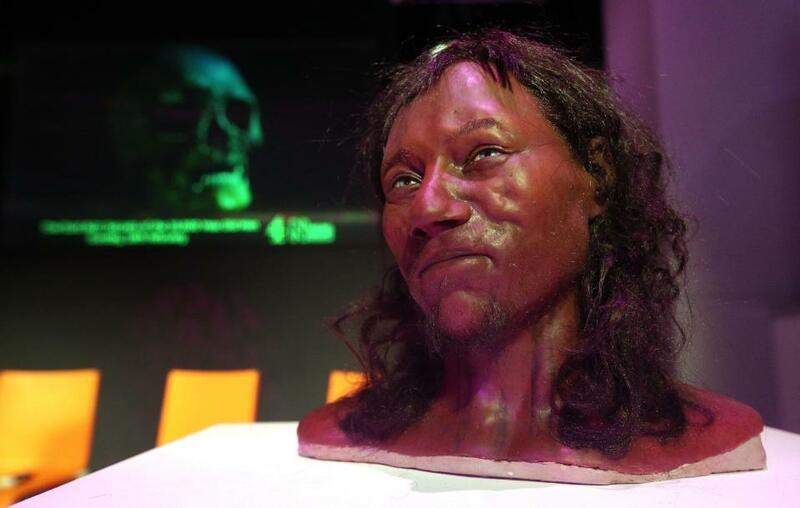 So just because this “Cheddar Man” had dark skin doesn’t necessarily mean he came from Africa. Those who hold to the “Out of Asia” or “Out of Australia” theories of evolution would say he may have came from India or even Australia. No the OOA theory is NOT the only evolutionary theory around. Sadly we get caught up in all the hype and the PC and this professor is simply pushing the hype. If he told the whole truth he’d only be able to say that this person had “dark skin darker than modern Europeans” but for him to assert that this person had “black skin” is a stretch! And if this person, this black skinned Brit, had black skin then where is the DNA evidence for such in modern Brits? Surely their would have had to have been a sizable breeding population of dark skinned Brits and some of that DNA would still be evident in modern DNA. I’m not trying to be racist but what I am trying to do is set some facts straight that this professor has simply glazed over. And I am trying to expose junk science in the hopes that academia will one day return to REAL science and drop the PC crap! And, additionally, I want to correct the PC concept and MYTH that race is “imaginary” when the biological and medical science says otherwise. Thanks for both the comment and the reblog. Your site looks very interesting; I look forward to exploring it. Race is NOT “imaginary”!! And ancient Europeans did have darker skin than modern Europeans do today but it was not black! It was more like the tan skin we see in Native Americans. Look up the “irano afghan type”, it is a type similar to neolithic Mediterraneans (and may correspond with the Near eastern component in the genetics of Aryans) and is described basically as a darker version of the Nordic type found in europe (keep in mind though this isn’t the only phenotype in Northern Europe, as many paleolithic types like Brunn and Borreby exist due to higher Paleolithic DNA in Northern Europeans). Originally the Aryans weren;t really that blond or light skin, though the frequency of these traits were higher than in other populations and eventually grew due to Vitamin D requirements living in a place with little UV radiation and their dairy based nomadic lifestyle, hence the correlation with lactose intolerance. Mixing with local African steands over time due to the Neolithic did occur, but semetic spreads occurred much latter and is most evident in Y chromosomes which are different between Seemetic horners and Cushitic horners. I will also add that the Kalash people of South Asia are one of the blondest non european peoples with Aryan ancestry. Though Blondest aside, Eye color may be more helpful to see the connection. Aksumite were indeed Semitic in language and culture terms, but they related more with their fellow Ethiopians than ppl from Levant. Because of this most scholars say that they and other Ethiosemitic speakers were Semiticied Cushite ppl. That’s been my assumption as well, but I think there was also an infusion of Levantine blood. Ethiopian tradition states as much. There is also another theory which states that the ancestors of Ethiosemitic speakers broke away from other Semitic speakers in Egypt and head south to present day northern Ethiopia while the ancestors of other Semitics went to Levant. This early split between them could explains why Ethiosemitic languages are very different than Levant Semitic languages. It’s has been proven that there were already Semitic languages in Ethiopia at least as early as 2800 BC (long before the coming of Yemenite emigrants). It has always been proven that the civilization of Ethiopia was started by local Ethiosemitic and Cushitic speakers (some centuries before the coming of Yemeni emigrants). Those Yemeni and even Levantine emigrants like you said seemed the reason why some Horn Africans have lighter skin. Chedder Man resembles Kenniwick Man. Maybe he is a pre-racial. Why would such a thing have happened in the first place? You touch on some interesting questions, JAY. I would offer that it is highly unlikely that any people who occupied Albion, later to become Great Britain, 12,000 years ago were of much if any relation to even the oldest occupying tribe on that land today. First, the people who are generally referred to as Britonic are of a certain sub-clade of R1b haplotype (the “Celtic” haplotype). These people are related to all R1b people, the other primary European sub-clades being those that comprise the bulk of the modern Dutch, a Southern German variety, an Italian variety, and a Spanish variety. The sub-clades evolved in a relatively short time period, mostly from interbreeding once somewhat isolated from their genetic brethren. “White” R1b people, in general, migrated from Anatolia / Central Asia much later than 10,000 BC. If these 10,000 BC Britons were R1B, then it is unlikely that they were of the same tribe that currently comprises a part of what is held to be the traditional British people. Instead, they could have come from the Middle East or Africa, having departed from the European tribes at a much earlier date. The arrival of the Germanic English and Norman people, of course, came well within the period of established history and have are even less likely to have a relation to anyone on the island in 10K BC. For interest, look into the mythological history of the ancient British Kings. These are the stories that these ancient Britons tell about their origins. These origins do not begin in Britain, but instead in the regions that I previously mentioned. The second question that you pose is how and why the spread of Indo-European language is not consistent to race. It’s a great question, with some extremely interesting and, I’d offer, concealed answers. It will take a lot of close research to gain a clue. Indeed, though, it isn’t consistent to race for the same reason why many Ameri-Indians speak English. Though, this is also a complicated issue because you will now have to differentiate between what, today, is generally considered to be a monolithic “white” race that is actually comprised of at least two relatively genetically distant races (“Celtic” haplotypes and “Germanic / Nordic” haplotypes, both with their own historically significant sub-clades and branches). You should assume that these groups may have not merely spoke differing languages, but languages from differing language families (ie: not all may have originally spoke a language of the IE language group that is most closely associated with the R1a haplotype). To start, as a rhetorical challenge, can you tell me where the R1b tribes evolved vs. where the the R1a tribes evolved? They evolved in proximity, but still separately. Don’t assume that these tribes were not enemies (as they are today) and do assume that they may have considered themselves to be vastly different. What were the ancient geographic divisions? Where are those divisions today? Similarly, where and how did the I1, I2a, J1, and J2 tribes evolve? What about the G2a tribe? What were the economic modes of each of these groups, and how is that important today? Did any of these groups become symbiotic throughout history? When / where? What is the probable haplotype identity of the earliest tribes that are mentioned, for instance biblically or from ancient Greek sources, as existing throughout the Near East, Anatolia, Central Asia, etc? Beyond that minutia, what you are ignoring is the immense, relatively modern, events that made the ME what it is today demographcially speaking. “White people”, with the exception of I1 farmers, evolved outside of what is today known as Europe. Why did they migrate to Europe? What force pushed them there? Did this force cause the invaded to adopt their language, or could there have been an instance where this invading force decided to practice a form of identity theft and instead adopted the language and heritage of those who they invaded (excepting for one key cultural feature)? What were the defining events of Central Asia in the past 2000 years or so? Who are the Turks? What was the genetic effect of he invading Mongol Hordes, perhaps even extending well before the well known vast invasion of Ghengis Kahn? These invasions would have left a severe genetic legacy. What is it?